Ultra thin Mouse Pad , performance to provide you a kind of relax mood all the time. Mouse Pad Non Slip , strong static absorption between your table and mouse pad reduces the danger of your mouse pad to fall down on the floor. Reuseable and adjustable stick pad won’t ruin your desk,hard and precise surface without bump allow laser moving fast and not jumpy. Washable Mouse Pad , exclusive waterproof effect, the newest design of this silicone back & PU Surface mouse pad. The glass office table is more worthy of having the mouse pad, Suitable for all kinds of mouse. (MIDDLE SIZE) multifun mouse pad can protect efficiently your Mouse in performance and functions,our R&D designed this kind of mouse pad through many trials to analyze the needs of customers and use it in person, then to improve it. 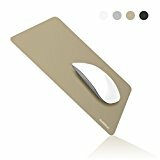 ● Ultra thin Mouse Pad – Only 0.4mm thickness. ● Mouse Pad Non Slip – Exceptionally fit glass office.Anti-slip rubber base provide strong static absorption between your table and mouse pad.Fit for flat desk. ● Mouse move smoothly – Precise and hard PET material surfance allow your mouse move fast whithout jumpy.Great to use for gaming/office work. ● Washable Mouse Pad – Made with waterproof material,it is washable and durable ,so it can be reused after travel.